Trading in Vivus (VVUS) is halted this morning, as the biotechnology company’s new weight-loss pill, Qnexa, is being reviewed by a panel of experts at the FDA. In many respects biotechnology stocks – particularly those which do not yet have products that are commercially available – are options dressed up as stocks. More than other sectors, a biotechnology stock is a company that is a portfolio of options on all the projects (drugs) that are in the research and development stage, plus commercial products which can be valued with more traditional discounted cash flow models and the like. Options on biotech stocks without any commercial products are therefore a lot like options on options. For those biotechs where the value of the pipeline is skewed largely in the direction of a single drug, the option on the option of a single drug can result in extreme uncertainty and implied volatility, as highlighted in VVUS Implied Volatility Tops 700. With the FDA panel decision due out today, investors have been valuing VVUS stock on the basis of a probability-weighted set of outcomes that could easily double or halve the stock price when the stock opens for trading again. As the time of the FDA panel decision has approached, it has been interesting to watch the price of VVUS options. For the most part, the prospects for the company and the probabilities associated with the FDA panel decision have changed very little. 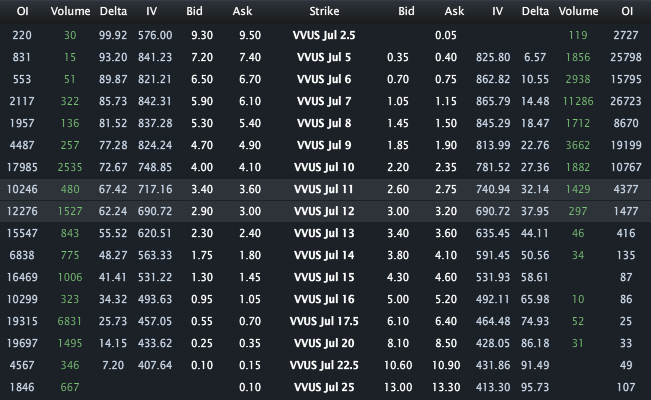 The charts below show there was very little change in the price of VVUS options from Tuesday at 10:34 a.m. ET, when VVUS was trading at 11.93 (top graphic) to the end of yesterday’s session, when VVUS closed at 12.11 (bottom graphic). Notice, however, that while the price of the various options held steady, the implied volatility spiked even higher in order to support the same options values as time decayed and the July options expiration neared. A good example is the July 11 calls, which showed a bid-ask of 3.40 – 3.60 in each instance, yet the implied volatility had to rise from 717 to 885 in order to maintain the same option price almost two full sessions later. With VVUS, we have an interesting glimpse of the options pricing model at work. 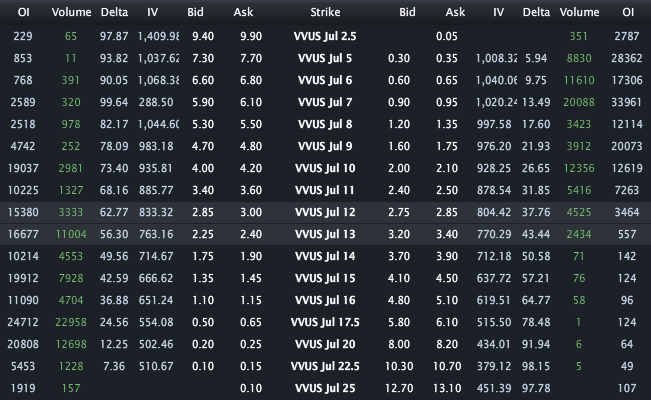 With the underlying, option price, strike price and interest rate unchanged, what we see with VVUS is almost a pure interplay between implied volatility and time. Assuming VVUS opens up for trading on expiration day tomorrow, I will be watching the collapsing volatility and gyrating stock price as the pricing model transitions back to a more common interplay of implied volatility vs. the price of the underlying.